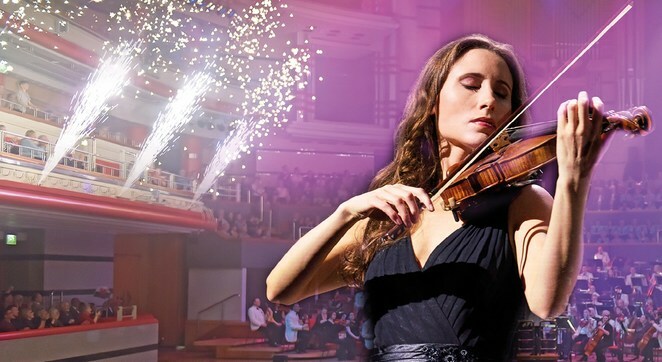 Forming part of Birmingham Town Hall Symphony Hall Christmas and New Year celebrations, this evening of music centred on one composer – Pyotr Ilyich Tchaikovsky. And there was plenty of music to choose from. Tchaikovsky died at the age of 53 but he was a prolific and varied composer, creating some of the best-known ballet scores, opera, concertos and overtures. Presented by Raymond Gubbay and performed by the London Concert Orchestra, this performance featured largely familiar music from across the breadth of Tchaikovsky's output. Beginning with the Romeo and Juliet Fantasy Overture, this piece of music has accompanied love scenes in movies for decades and was beautifully recreated by the orchestra. Centre stage was then given to violin soloist Jennifer Pike whose Violin Concerto in D was magnificent in its dexterity but also its emotional intensity. Pike was the youngest winner of the BBC Musician of the Year in 2002 when she was aged just 12 and she has fulfilled that early promise with a string of international performances and recordings. After the interval, the second half of the production was largely a Tchaikovsky's greatest hits with music from his opera Eugene Onegin and his ballets The Sleeping Beauty and Swan Lake. Conductor Benjamin Pope ensured the orchestra was both confident with the well-known music which, even taken out of context in this kind of hits formula, reminds us just how masterful a composer Tchaikovsky proved to be. Pope also ensured plenty of audience engagement by sharing stories of backstage and onstage ballet blunders. The programme concluded with Tchaikovsky's dramatic 1812 Overture – always a crowd-winning finale. With its thunderous recreation of the 1812 Battle of Borodino and the pride of Russia riding on its soaring strings and crashing cymbals, it never fails to stir the heart. And just to add an extra layer of spectacle to this spectacular, the piece ended with fireworks and pyrotechnics above the Symphony Hall stage. A standing ovation led Pope and the orchestra to give the audience an added treat with an excerpt from Tchaikovsky's Christmas ballet The Nutcracker – ensuring a full programme of the composer's music.